The British Physics Olympiad (BPhO) is a charitable trust that operates out of the Physics Department at Oxford University. The BPhO offers challenges each year to budding physicists who are secondary school age. Whilst physics is inherently all about problem solving, the aim of these challenges is to push students beyond their current qualification level with questions that are open ended and unstructured, helping them to develop the skills necessary for entry into the top universities. There is also chance to represent Britain at the International Physics Olympiad for those who achieve the top marks. 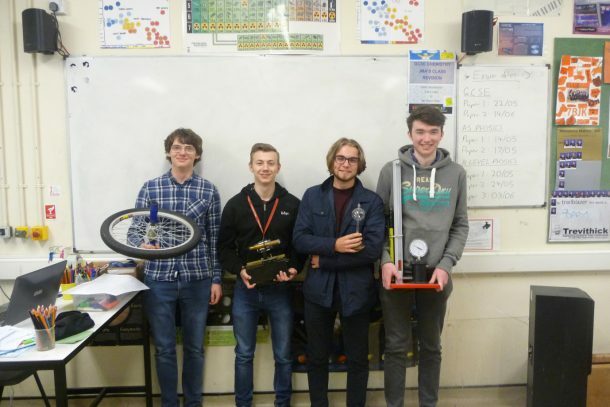 Four students from Launceston College took part in the A2 challenge this year; Filip Janicki, James Barriball, Isaac Whale and Harry Draper. The paper tough, as expected, consisting of questions on internal resistance, kinematics and thermodynamics. All performed very well, scoring marks on all sections. The standout performer was Isaac Whale who managed to achieve a merit, a fantastic achievement. They are the first students to be entered into this challenge from Launceston College. The current year 12 physics students will make excellent candidates for next year’s Olympiad.